Warning: this review may contain spoilers for the first book, Blood Red Road. If you haven't read Blood Red Road, I highly recommend it! It's about an incredibly tough heroine on a quest to save her brother in a post-apocalyptic wasteland. In Blood Red Road, Saba had one goal: find and save her twin brother Lugh from the people who took him. Saba knew that once she found Lugh, everything would be all right. But everything is most definitely not all right. Lugh and Saba have both been changed by the traumatic things they experienced, and the bond that connected them their whole lives seems to be broken and unrepairable. Saba and Lugh, along with younger sister Emmi and another young man, Tommo, are on their way west to start a new life. Jack, whom Saba recently discovered is her heart's desire, separated from them to take a hard journey to deliver bad news, but he promised to meet them in the west. Saba is desperate to go west and find Jack again, but the group is stuck in the Waste, waiting for an injured horse to heal. Then word comes that the Tonton, so recently defeated by Saba and her friends, have a new leader, who is cleansing the land of everyone except his own followers, killing or driving out the weak and the old, and taking the young and healthy. What's worse, Jack has been seen with the Tonton and may be one of them. Saba can't believe that Jack would be a part of such horrors, and she's determined to go back and find the truth, and help if she can. Like Blood Red Road, Rebel Heart is a roller coaster of a story that grabs you and won't let go. Saba is one of the best YA heroines I've ever read. She's tough, oh yes, she's tough, but she also has heart and depth and an unshakeable resolve. Saba is a flawed heroine. She makes mistakes, she's not always kind, and she sometimes lets her single mindedness blind her. But Saba is a person who cares deeply, and would do anything for her family and her friends. As with the first book, Rebel Heart is told in first person in Saba's distinctive voice and dialect, which is a little difficult to read at first, but it doesn't take long to seem natural, and it's such an integral part of the book that it's hard to imagine this book without it. The entire book is also written without quotation marks. All dialog is simply written out as part of the text with nothing to set it off. This also seems odd at first, but you get used to it and don't notice it. The biggest effect, to me, is that with the breakneck pace of the novel, the lack of quotation marks to slow the eye down contributes to a feeling of going downhill without brakes. 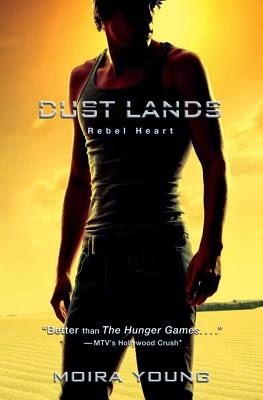 Overall, Rebel Heart and its predecessor, Blood Red Road, are excellent books that will have strong appeal to anyone who enjoys dystopian YA literature. Although more post-apocalyptic than dystopian, there are some dystopian elements in the Tonton society ruled by their new charismatic leader, the Pathfinder, and the book has a dystopian feel to it. Rebel Heart ends on a bit of a cliffhanger, and the third book, Raging Star, is due out May 13. I can't wait to read it! Anyone who enjoys young adult dystopian books and who doesn't mind the unusual punctuation and dialect. Rebel Heart is a 2013 Cybils Awards Nominee. The first book, Blood Red Road, was the 2011 Cybils winner for YA Science Fiction & Fantasy. Rebel Heart is available as an audiobook from Audible.com. I haven't yet listened to the audiobook, but I did listen to the audiobook for Blood Red Road and thought it was very well done. Narrator Heather Lind did an excellent job. There appears to also be a version narrated by Moira Young, but Audible tells me it isn't available in my area, so I suspect it's the Canadian version. The links below are to the Heather Lind narrated version.